Built to accentuate the ocean view, this main level entry home presents many luxurious features. 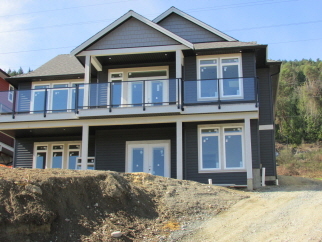 Boasting beautiful views of the Ladysmith Harbour, Gulf Islands and Coastal Mountain Range with French Doors opening from the Livingroom to the deck that runs the entirety of the front of the home. Cork flooring runs through out the house and is warmed by in floor heat. 9-foot tray ceilings in main living space provides a light filled space with well appointed kitchen boasting quartz countertops, built in appliances and island. Master Suite provides a generous walk-thru closet which accesses the 5-piece ensuite with quartz double sinks, free standing shower w glass doors and soaker tub. Downstairs provides a 1 Bedroom Legal suite with laundry room, patio and separate entrance. GST is applicable to sale. All information should be verified if fundamental to purchase.